Aasan hai badalna -- It is easy to change, says the new tagline of cross category online classifieds business firm Quikr, which last week donned a new avatar with a new brand positioning. India’s online listing space is witnessing phenomenal growth and as smartphone adoption increases, India is emerging as a mobile first country. Nearly 65 per cent of internet users are on mobile and 40 per cent of all e-commerce transactions are on mobile, according a study by venture capital firm Kleiner Perkins Caufield Byers in May. Quikr gets about 30 million unique users a month, the company claims, and is changing to cater to the changing consumer. The new logo, which retains the old blue and green colours, “is contemporary, yet sleek with a sense of speed which is integral to the name . Our consumers have evolved in terms of aspirations and their connect with categories and lifestyle also has changed. We believe in being in line with changing consumer needs,” said Vineet Sehgal, chief marketing officer at Quikr. The company, started in July 2008, timed the rebranding process, which took six months, to meet the company’s thrust on mobile commerce and e-commerce assisted by robust supply chain and logistics. The easy to change motto is also to capture this shift in consumer usage trend. “When we started, we were in a stage of building a simple and trustworthy marketplace. Now, we are in the second phase where we want to expand our offering through more sub-verticals in homes, cars, jobs and services,” Sehgal says. The company has introduced four new categories – QuikrHomes, QuikrCars, QuikrJobs and QuikrServices to get more consumers on board. 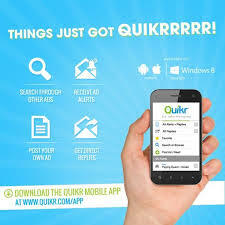 “Quikr wants to keep up with the young and aspiring digital-savvy population of India. Our new slogan reflects this,” he says. Having a stronger digital presence while staying ahead of the curve were the most important demands set by Quikr before creative ad agency Alok Nanda & Company. “Today you cannot create an identity if it does not work on multiple screens. That is actually a great opportunity because you can bring in movement and sound,” said Alok Nanda. The brand logo is readable in small screens, has a distinctive identity and has colours that permit long distance readability. In recent months, India’s startup space has seen several firms opting for a refreshed look. Online real estate start-up Housing.com had undergone an identity change and introduced the colourful ‘Look Up’ logo around the time of Holi in March. Online retail major Flipkart had also revamped its logo in May. The company, which intends to go mobile-only soon, unveiled a new mobile-friendly logo with a strategic tagline ‘Ab Har Wish Hogi Poori’. Zomato, the restaurant search and discovery platform rebranded twice within three months. It had a logo change in November 2014 when it introduced the heart and fork logo and in February, it adopted a spoon logo after it acquired US-based rival Urbanspoon in January. “We had to make sure we could move Urbanspoon’s existing users over to Zomato in the most seamless way possible. Given that they’d have to get used to a new name, and a new product altogether, we felt retaining the spoon as a means of recognising the brand would make for an easier and cleaner transition,” said Deepinder Goyal, co-founder and chief executive officer of Zomato. While he agreed that it was a tough call since the company had rolled out the heart logo not long ago, it was a safe bet as long-term benefits far outweighed short-term challenges. Nanda, who worked on the Quikr strategy, feels that any new branding should build on the past. “Do not ignore it unless there is a real reason to shift,” says Nanda. Brand consultant Harish Bijoor agrees: “It is important to stay closer to the tone, tenor and decibel of what the company was prior to the rebranding. Care has to be taken to not distance too much while looking different. ” The rebranding should make the company contemporary, he said, adding it is extremely important to be strategy centric but not creative centric. “In case of Quikr, it is a slight rebranding. But the fonts used make it look more contemporary,” Bijoor said. Who is the hottest July cover girl? VOTE!